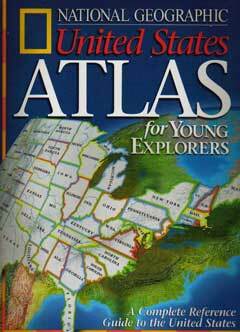 The National Geographic Beginner's World Atlas and the National Geographic United States Atlas for Young Explorers are the latest in a children's series launched by the Society in 1998. Included: Geography activities for students and families! The National Geographic Society's world-renowned mapmakers, working with education consultants and geographers, have created two new state-of-the-art atlases for young readers: the Society's first-ever world atlas for children ages 5 to 8 and an atlas of the United States for children 8 to 12. "You won't have to push these atlases onto your children," said Nancy Feresten, director of children's book publishing at the National Geographic Society. "You won't be able to get them away from them." The Beginner's World Atlas features large-format, easy-to-read physical and political maps of the world, with more than 100 color photographs carefully selected for their appeal to young children. The images and age-appropriate, fact-filled text make people, places, and natural wonders come to life. "National Geographic, with its world-renowned standards of quality and accuracy, is uniquely qualified to introduce young children to the people, animals, and places of the world," said Feresten. 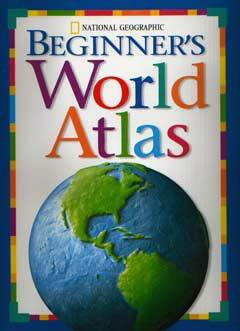 "This compelling beginner's atlas will teach kids to read maps and appreciate the scale and diversity of their world." The United States Atlas for Young Explorers uses images from satellites high above Earth, and pictures shot by National Geographic photographers from unusual angles on the ground, to illustrate the accompanying two-dimensional maps. The book looks at the nation's 50 states, its territories, and the District of Columbia in 176 large-format pages of maps, photographs, and art. "What's special about the United States Atlas for Young Explorers is that National Geographic cartographers created large, age-appropriate maps that are not only beautiful to look at but layered with information," Feresten said. "The maps have symbols that locate economic activities like agriculture, mining, manufacturing, and service industries. At a glance, kids can see the mountains, rivers, and cities as well as how residents of each state make a living." The United States Atlas is a showcase for National Geographic photography. Full-color photo essays introduce each region, while specifically designed thematic spreads focus on topics such as territorial growth, population, the natural environment, and endangered species. Content reinforces the National Geography Standards, which are stated in the free guides available to teachers from bookstores stocking the atlas. The standards, drawn up by educators, suggest an agenda for teaching and learning geography applicable to all states and school districts. Use removable stickers to mark on a map places in the United States and abroad that family members have traveled to. Turn a restaurant visit into a lesson in world geography. Ask children to find the country ( Italy, China) the food served came from and to read about regional foods and customs. Talk about why some foods are suited to their countries of origin ( Chinese rice fields). You might also try to guess where the food on your plate at home came from. Were the potatoes grown in Idaho or Maine? Was the coffee from South America? How does the season affect where the food might come from? Learn geography while planning a real or imagined vacation. Ask each family member to research a place they'd like to go to. National Geographic's atlases and magazines, and the www.nationalgeographic.com National Geographic Web site are good sources. Check the Internet, newspapers, travel guides, and other sources for more information. Share what you learn and vote on the winning destination. Sign up for a pen pal from another country on the National Geographic Web site. Write a letter to your new pen pal and try to map out the route the letter may take after it is mailed from your local post office. List your family's favorite sports teams. Use the atlas to look up the teams' hometowns. How many of the teams' names reflect the geography or history of their hometowns? Play a family-tree geography game using the atlases to locate the countries your ancestors came from and the places your relatives live now. Go on a geography safari at the zoo. On your next zoo trip, give each child a list of animals they might see. Ask them to try to find out the native countries or continents of each animal and to note the locations on the list. Find each country or continent in the world atlas. Make a treasure map of your yard or neighborhood, including common map symbols such as trees, roads, or railroad tracks. Be sure to include a key so treasure hunters can follow the map. Then, using the symbols, give directions to the treasure. Play a place name game in your classroom or on a long car trip. One person names a place (for example, Ohio). The next person must name a place that starts with the last letter of Ohio (for example, Oregon). When someone is stumped, they're out of the game. The last person left in the game is the winner.